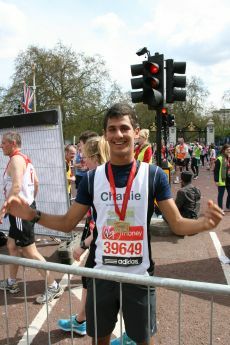 37,500 runners took part in the 32nd London Marathon on Sunday 22nd April 2012. Five of them, Simon Azouelos, Ben Jacobs, Charlie Gould, Jamie Rosen and Tanya Collin-Histed agreed to complete the 26.2 miles course of behalf of The Gauchers Association. Read below how our tremendous runners describe their experience of the day. 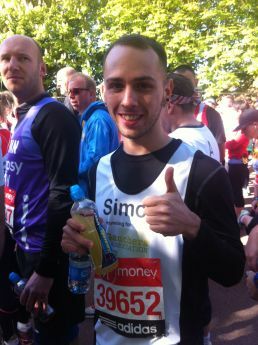 Simon Azouelos – I was number 39652 and the only thing I ever ran for was the bus when I was late for school and I was a lot fitter then too so the decision to run the London Marathon for Gauchers was not taken lightly. Even though my training started last summer it felt like the Marathon came before I felt truly ready; an old knee injury reared its ugly head again which only added to my already wrecked nerves. After a week worrying about cold temperatures and lashing rain, race day conditions could hardly have been better. The sun shone down keeping the thousands of spectators happy as they cheered us all along. The first four miles were fine but I’ll be honest, thereafter I was not very comfortable at all. The wonderful people of St. John’s Ambulance helped strap my knee up and provided me with ice packs – my body didn’t want me to do this because as you run the brain tells you to stop but you must be strong – and he support from all those lining the streets is nothing less than amazing. Finishing would not have been possible without them. Also seeing my friends and family gave me that last push to keep going. I eventually finished the race in six hours and three minutes and the miracle is not that I finished at all, it’s that I had the courage to start. Sadly not the time I was after, but simply crossing the finish line was greeted with an overwhelming sense of relief and achievement. Given all that I would relish the chance to run the London Marathon again – I not only challenged myself to go beyond my limits, I was able to help others who suffer from Gaucher disease by raising over £1,300 to support research, the sufferers and their families. What are my closing thoughts about my London Marathon experience? Anything is possible, but you have to believe and you have to fight. Pain is momentary. Pride is forever. Ben Jacobs – Running the marathon in aid of the Gauchers Association is one of the most incredible experiences of my life. Seeing the finishing line and sprinting towards it after more than a year of preparing for that moment was as painful as it was fulfilling. So, after a year of running in such heavy rain my shorts fell down and cold baths prompting screams I didn’t think I was capable of, I’m off to stuff my face and rest...until next year. Thanks to all at the Gauchers Association for the experience of a lifetime. Charlie Gould – Running the Marathon was one of the hardest and most amazing experiences I have ever had and I think that I proved a lot to myself. In terms of training however, it was a disaster. Having never been to the hospital before in my life, the hospital and the physiotherapist became my second home very quickly after I started training. In only my second week, I tore my calf playing football and very quickly I realised that if I wanted to complete such a huge challenge, I would have to focus just on running. exploring cities such as New York, Washington DC and Miami by running and was a great experience and by the middle of April, against some highly stacked odds, I was ready. originally set for myself. I finished in four hours 25 minutes and so I was very pleased with myself that I had actually finished and done it in a good time. It was an incredible feeling and it was an absolute honour to run for the Gauchers Association and I intend on running the Marathon next year as well to raise money for a brilliant cause. 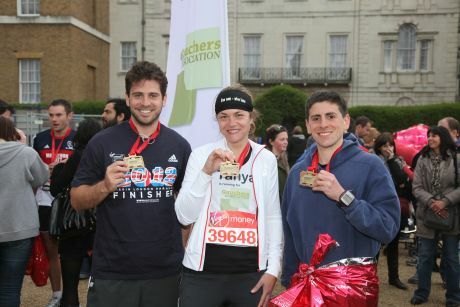 Jamie Rosen – My decision to take part in the London Marathon was totally spontaneous. My father, Alan Rosen has been taking part in the Gauchers Association Bike Ride for a couple years now so I thought now it was my turn but of course I had to do one better! This was my first Marathon and let me state for the record that it will certainly be my last! However, I have just signed up to a half marathon race in July in South Africa so you never know. Leading up to the race I struggled quite a bit with niggling injuries and ended up not running for three weeks prior to the race hoping my achilles would hold up, which thankfully it did (until about mile 19). Being able to train in Cape Town made me a little bit more blessed than the average person training for the event but it was still seriously hard work. The day itself was fantastic and the atmosphere was like nothing I have seen before. of just over 4hr 30mins. It is something I will certainly add to my CV! I must also mention how fantastic my friends and family were in their donations to the cause. I raised over £3,500 and I can finally say I have done my bit for the hard work and effort everyone puts into the Gauchers Association. Finally, Tanya Collin –Histed – In 2010 I went to watch our five London Marathon runners and sat in the charity seats on The Mall cheering for them and all the other thousands of people running. It was quite emotional seeing the exhaustion but pure determination of the runners as they were nearly at the finish line. More than once I saw someone stop and help a fellow runner who was struggling to cross the line. I said to myself ‘these people are just normal people, like me, I could do this’. I went home inspired and two weeks later after buying a proper pair of trainers I ran a mile (slowly) and came back red faced and struggling to breath. Nine months later I ran the Brighton Half Marathon in two hours two minutes and 29 seconds and I was one step closer to my goal of running the Marathon. I signed up for the Gauchers Association London Marathon team for 2012 and launched my fundraising page in December 2011 and after I received my first donation I knew there was no going back. For those of you who know me, I am stubborn and knew that even if my body struggled to get me over the line my mental determination would. I was extremely nervous in the week running up to the Marathon, ask my family and work colleagues (to whom I have since apologised) but Sunday morning came and I joined about 50 other runners on the station platform at Putney Bridge with my red runners bag. I was ready. Waiting for the starting blower was overtaken by trying to get to the front of the toilet queue, but at 9.43am I ran over to zone eight and took my space amongst thousands of other runners who were all smiling and jigging up and down. I loved it there were live bands and singers, and crowds shouting and clapping all the way along the route. The first eight miles seemed to fly by and I knew my family were waiting to cheer me on at the 14 mile marker and seeing them was amazing and spurred me on. I knew they would be at 21 miles and that was a real boost to me. At 18 miles, I knew that this was the furthest distance I had ever run and it was a great feeling to still be smiling and feeling good. At 20 miles, I thought ‘I’ve run 20 miles – wow’ and then at 21 there were my family again. The last 5.2 miles were so loud and everyone was so supportive, people I didn’t know were calling out my name and cheering me on and the only time I struggled was around 25 miles in when I would have loved to have seen a familiar face. Turning into The Mall I could see the finish line. I was going to finish. I felt amazing, my body was still holding up, my mind was buzzing and when I crossed the line, I felt like I was on top of the world. I would like to thank all my friends and family who sponsored me to the tune of over £3,700 for the Association and to say thank you to everyone who believed in me and told me I could do it. That’s another tick off my bucket list. What’s next? The Association would like to thank all its members, friends and supporters who helped to raise over £13,000 for the Gauchers Association. Special thanks go to our runners who endured the 26.2 mile course to help us in our work.